“It’s been my dream for over a decade. We have everything to do it properly.” says Pétur Már Ólafsson regarding Iceland’s status as Guest of Honor at the Frankfurt Book Fair this year. Pétur Már is Publisher at Bjartur-Verold, a Reykjavik-based publishing house with a strong fiction list. The added attention has had an amplified effect in the tiny Icelandic market. “The most important thing is that many of our authors are being published in Germany,” says Pétur Már. Everyone hopes that the momentum gained there will spread elsewhere. Pétur Már, a longtime Icelandic publishing veteran, founded Verold in 2005. They found their first success with Steinunn Sigurðardóttir. “I gave her a call and said, ‘Do you want to be the star author of a new publishing house?’” She did. Verold published her first book in 2005 and sold translation rights in 15 languages before it was published in Icelandic. “The first offer came two hours after I sent off the materials.” It was such a hit because of the quality of the writing of course, but also because Pétur Már had been Arnaldur Indriðason’s publisher, and had built up a great deal of trust among his contacts due to that success. In 2007 Verold merged with Bjartur, an older publisher, becoming Bjartur-Verold. Both houses have strong literary programs, in translations and Icelandic literature. The financial crisis actually created one genre in Icelandic literature. Prior to the crash, Icelandic books on current affairs did extremely poorly. History titles on World War II, for example, could succeed in Icelandic but Icelanders tended to seek out English-language books when it came to politics and current events. “But after the crash people became more interested in current affairs,” says Pétur Már, and for the first time they wanted books on their own politics. 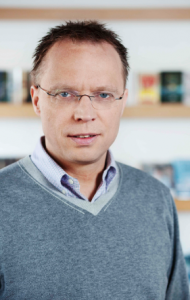 When the government published a huge report on the Icelandic financial meltdown, Bjartur-Verold was able to bring out a book on it about three weeks after its publication. They’ve done other similar titles, on Wikileaks for example, succeeding in a way unthinkable four or five years ago. Even when it’s not being shaken by global financial meltdowns, the Icelandic book market isn’t the most stable in the world, simply owing to its tiny size. “It’s a fragile business,” says Pétur Már. Following trends can be particularly dangerous. “Scandinavian crime fiction is very strong, but we don’t know how long it will last.” Bartur-Verold’s core is and will remain literary fiction. Other genres enrich their program but won’t define it.